Your goal is to become a biologist, and we want to help you achieve that goal. Our Master of Science (MSc) in Integrative Biology provides an interdisciplinary approach to biological research that allows you to explore the answers to complex questions from a perspective that bridges the traditional sub-disciplines of biology, across diverse taxa, over time scales ranging from short (physiological) to long (evolutionary). In our program, you’ll learn to think nimbly about biological problems and processes. You’ll develop an advanced confidence in your ability to learn, think and act in a way that is supported by concrete and well-demonstrated skills in critical thinking and problem solving. You’ll gain the ability to design and implement a substantial original research project and to effectively communicate the results of that research in a variety of forms, including articles for refereed professional journals, presentations at scientific conferences, and articles for the popular press – all of which is required for you to become an expert and a leader in the field. 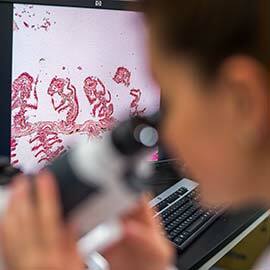 Our MSc in Integrative Biology is a full-time, 24-month program. In addition to a thesis, you are also required to complete BI601: Research in Integrative Biology and one elective course. Eligible domestic students admitted to study on a full-time basis receive a minimum of $21,500 a year. Such support may be made up of teaching assistantships, internal/external scholarships, and/or faculty-funded studentships or research assistantships. A Bachelor of Science (honours) with a major in Biology, or a related program. A minimum B average over the last two years of full-time undergraduate study. Contact a prospective adviser to discuss research opportunities prior to submitting your application.